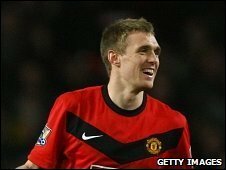 Footballer Darren Fletcher has been fined for a motoring offence. Penrith Magistrates' Court heard that the father of the Manchester United midfielder was caught speeding in his son's car on the M6 in Cumbria in 2008. The footballer then failed to respond to a request from police to identify the driver, and was summoned to court. The Scotland star was convicted of not providing driver identity information and given six penalty points, fined £650 and ordered to pay £900 costs. The case centred on his claim that he had not received the original notice asking him to identify the driver of his Range Rover which had been travelling at more than 70mph on the M6 on 27 November 2008. His solicitor said that children had been stealing post from a secure mailbox outside Fletcher's home in Bowdon, Altrincham, Cheshire. When he was sent a final warning in January 2009, Mr Fletcher contacted Cumbria Police and asked for a copy of the original notice, which again he said he never received. After getting another warning letter, in February, he contacted police again to ask them to send him a second copy of the notice. He received it, but failed to act, and admitted to the court that he had been "naive" not to do so. Kathleen Lisle, chair of the bench, said "Mr Fletcher admits he did receive the third copy, but also admits he did not respond to this within the time limit it was reasonable to do so. "His obligation was to comply and he did not do this and so we find him guilty of failing to respond." He was represented by celebrity solicitor Nick Freeman - also known as Mr Loophole - who submitted a notice to appeal against the conviction at the crown court.